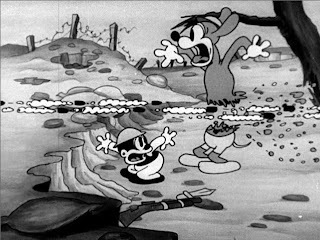 Cartoons like the “Katzenjammer Kids,” “Happy Hooligan,” “Mutt and Jeff,” etc., that run five hundred feet, require a staff of from fifteen to thirty people, men and women, to produce this amount of animated cartoon a week, with salaries ranging from ten to three hundred dollars per week, so you can readily get some idea of the time and expense involved. Cartoons such as these contain from two thousand to three thousand drawings, and it takes two photographers one solid week working into the nights under pressure to photograph these drawings. 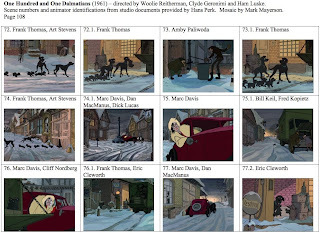 There are references in the article to Winsor McCay and Frank Moser. One other interesting thing is that Green's assistant was a woman referred to as Miss Kelly, with no first name mentioned unfortunately. The New York Times is reporting that the Hollywood studios have decided to push box offices success for the Academy Awards this year. With the viewership of the awards telecast falling every year for the past several years, the thinking is that the TV audience has no rooting interest in the independent, small films that the Academy usually honors. The way to higher TV ratings is to nominate films that the audience has actually seen. Disney will be campaigning for Wall-E in the best picture category. 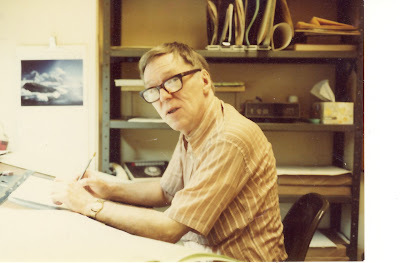 As early as midsummer Joe Morgenstern, The Wall Street Journal’s film critic, was arguing that “Wall-E” should be considered for best picture. “The time to start the drumbeat is now,” he wrote in a July 12 essay, noting the extreme difficulty animated films, while hugely popular, have faced in vying for the most prestigious Oscar. Only one, Disney’s “Beauty and the Beast,” released in 1991, has ever been nominated for best picture. The awards are often a rebuke to mainstream Hollywood, where the creative community gets to place art over business. The big question is whether the Academy membership, whose votes determine the nominees and the winners, will go along with this approach. 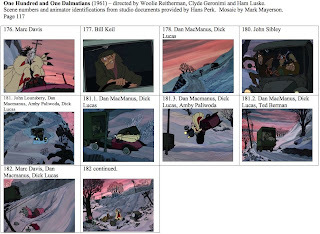 A rather startling layout from Chuck Jones' Bear Feat. The trees are an animated pan, adding even more interest to the shot. The latest, and last, Looney Tunes Golden Collection has been released. It's the sixth volume in a series that has delivered over 300 restored Warner Bros. cartoons as well as behind the scenes documentaries and commentaries. This edition contains two live action films of the staff made for Christmas parties in 1939 and 1940, several Captain and the Kids cartoons directed by Friz Freleng at MGM, two TV specials, a documentary on Mel Blanc, a generous selection of early black and white cartoons as well as propaganda cartoons made during World War II. All this in addition to a generous helping of the expected Warner Bros. cartoons. While Warner Bros. will undoubtedly continue to release cartoons on DVD, this may be the last time we see such elaborate extras and relatively obscure cartoons. 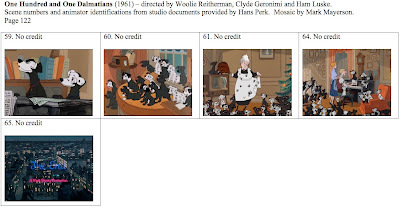 My guess (and fear) is that we'll be inundated with no-frills sets devoted to the most famous Warner characters, leaving the lesser-known cartoons to languish in obscurity. There is much to celebrate in this set. While many have expressed disappointment that a whole disk has been devoted to early Bosko and Buddy cartoons, I'm thrilled to have them (though happier about the Boskos than the Buddys). The early Harman-Ising cartoons run on adrenaline. 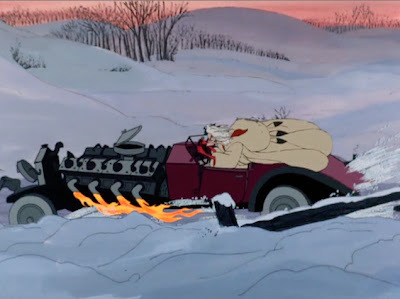 The enthusiasm that created these cartoons, and the speed and anything goes qualities on screen, are a reminder of how exhilarating animation can be even when it lacks polish. There's more animation in a single Harman-Ising cartoon than there is in a whole season of Family Guy. It's ironic to me that a culture that is obsessed with sports and watches reality shows like Dancing with the Stars somehow thinks that motion is an unnecessary frill in animated cartoons. 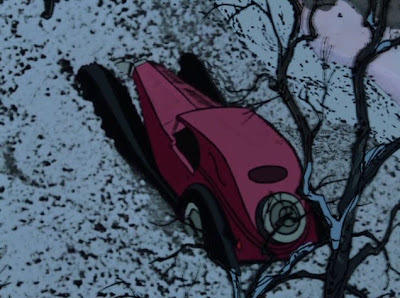 When did animation become a synonym for stasis? 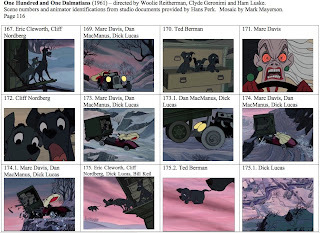 The youthful energy that propels the Harman-Ising cartoons sometimes resulted in great films. Bosko the Doughboy takes a perverse glee in the murder of cartoon characters. It's total war, stripped of politics or ideology. There's no reason for the chaos on the screen except for the pleasure of doing damage. This cartoon is a nihilist black comedy, fit to be run on the same bill as Dr. Strangelove. The two Christmas party films are live action equivalents of Looney Tunes. They show, without a doubt, that it was the sensibility of the entire staff that was responsible for the humour that ended up on screen. Martha Sigall and Jerry Beck provide commentary, and Sigall is one of the few people living capable of identifying so many of the crew, including the secretary and ink and paint women who normally remain anonymous. 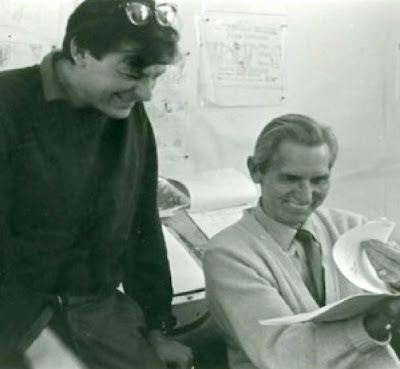 It's a real pleasure for me to see footage of animators such as Ken Harris and Bobe Cannon. 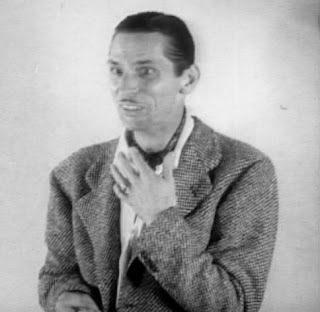 Bob Clampett's Russian Rhapsody is both a political satire about the relationship between Hitler and Stalin and a catalogue of caricatures of the Schlesinger staff, identified in the commentary by animator Mark Kausler. You have to turn to South Park for anything similar today, and of course, the quality of the Warner Bros. art and animation is far superior. All the directors are represented by excellent, though rare works. Besides Russian Rhapsody, Clampett's Horton Hatches the Egg is here, based on the book by Dr. Seuss. Chuck Jones cartoons include Rocket-bye Baby (a favorite of mine with lovely designs by Ernie Nordli), Chow Hound (a black comedy worthy of an E.C. 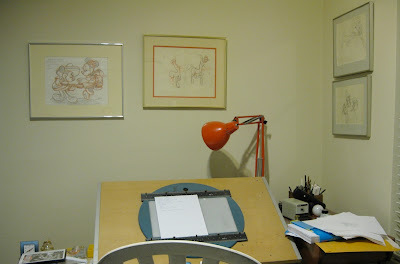 horror comic) and Now Here This (Jones imitating the Zagreb studio). 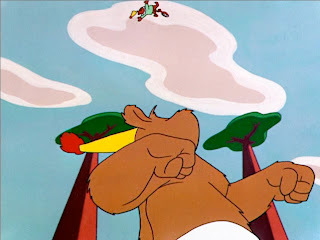 Freleng has Goo Goo Goliath in the UPA mode and Herr Meets Hare, written by Michael Maltese and an obvious precursor to Jones' later What's Opera, Doc? 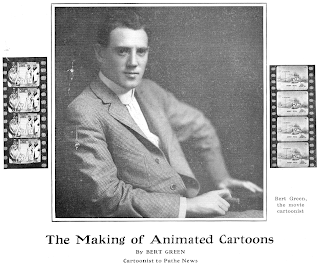 Bob McKimson not only has mainstream work of his like Crowing Pains in this collection, but also two more experimental films, The Hole Idea, which he animated himself, and Bartholomew Versus the Wheel, a modernistic fairy tale written by John Dunn. 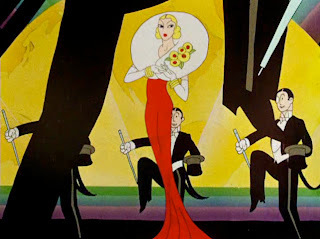 Tex Avery's Page Miss Glory is here in all its art deco splendor. 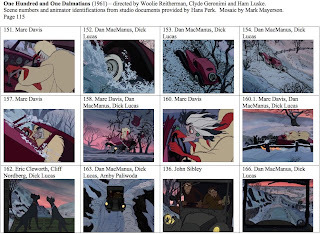 There's more than 30 years of Warner Bros. cartoon history here, but even if you're not particularly interested in animation from a historical standpoint, these cartoons are a treasure chest of artistic riches. There's a wide variety of stories and design approaches. There's great animation by Rod Scribner, Bob McKimson, Manny Gould, Ken Harris, Bobe Cannon, Ben Washam, Art Davis, and Virgil Ross. 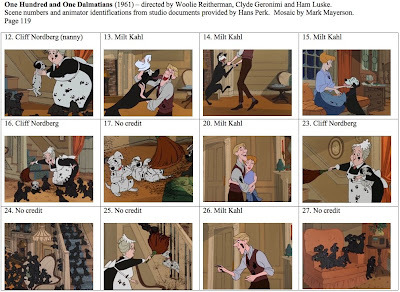 These cartoons are a textbook on how music can accompany animation and how it can be used to propel animation forward. 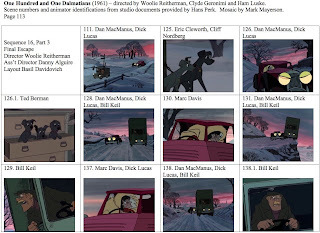 There is more to be learned from a set like this than from any book written about creating animation. 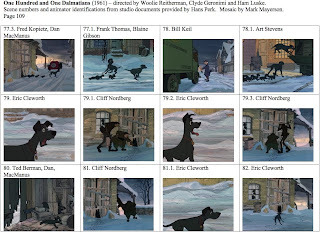 And this set is also an inventory of all the animation techniques that the industry has abandoned or forgotten. Sadly, it may also be the last time the Warner Bros. cartoons are collected with this much love and respect. Enjoy the Looney Tunes Golden Collections because we may not see their like again. 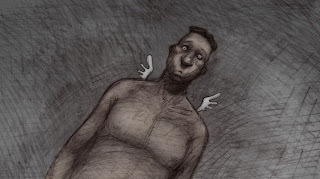 I've always had mixed feelings about Bill Plympton. He draws beautifully. 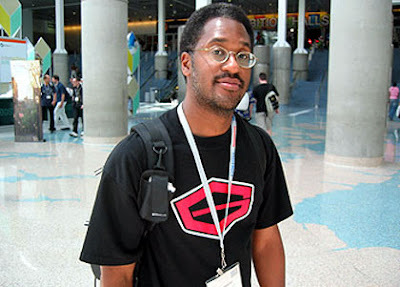 His short films always provoke a strong audience reaction. He is an inspiration as an entrepreneur, having developed his own market niche where he creates the films he wants to and makes a living at it. Where most independent animators produce shorts, Plympton has directed at least five features. 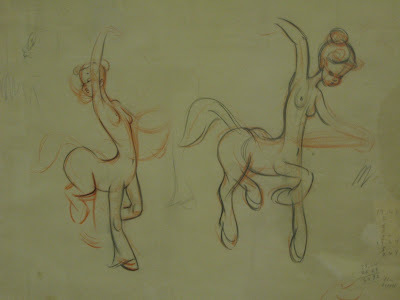 On the other hand, I think that Plympton's animation is starved for drawings. 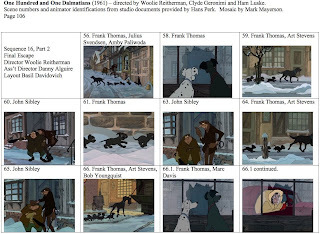 While I understand the economic necessity of limiting the amount of artwork he produces for a film, the animation and stories often feel padded as a result. While Plympton is a strong draftsman, he has trouble portraying weight and momentum in motion. Perhaps my greatest reservation about him is the shallowness of his characters. This isn't much of a problem in his shorts, which tend to be very gag driven, but becomes a larger problem in his features. Idiots and Angels is Plympton's latest. I saw it screened at the Toronto After Dark festival where it played to a large audience and got a good response. The story is a morality tale about a thoroughly unlikeable character who sprouts angel wings. The character and the wings battle for control of the character's actions and his soul. While many people thought that Wall-E was daring for doing without dialogue for forty minutes, Plympton has essentially made a silent feature. For eighty minutes, there is no dialogue and the storytelling doesn't suffer for it. What is lacking, however, is depth in the characterizations. 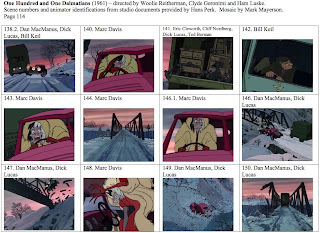 With the exception of the main character, the characters' personalities do not evolve over the course of the film. Plympton is good at communicating who they are, but once their personalities are established, the characters never grow or do anything unexpected. This lack of complexity is the film's weakest point. While eighty minutes is short for a feature, the film still feels padded because the characterizations are static. Plympton adds fantasy sequences and visually interesting direction (he does some marvelous things with match cuts), but all stories are about people, and these people aren't interesting enough to fully hold our attention. I've seen I Married a Strange Person and Hair High and think that this film is stronger than either of those features. 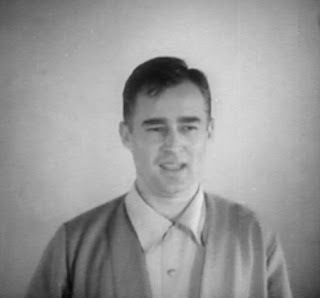 There is no question that Plympton is advancing as a film maker, but I wish that his progress was faster. 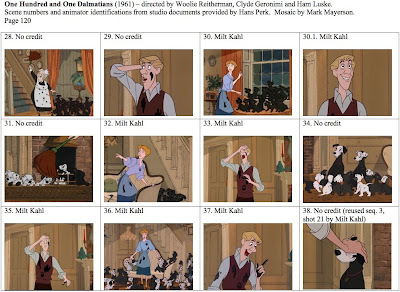 Economics may prevent him from ever putting more animation into his features, but the scripts could be improved. I wonder what Plympton could do if he had stronger characterizations to work with? 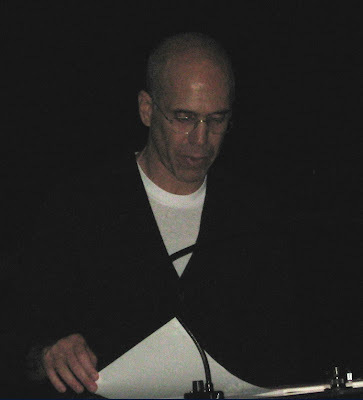 Perhaps he should adapt an existing story or collaborate with another writer. Idiots and Angels is definitely worth seeing. It contains some deft visual storytelling, some excellent gags and an intriguing premise, but I'm still waiting (and hoping) for Bill Plympton to make an animated feature that will banish my mixed feelings. For a look at the film's trailer, go here. 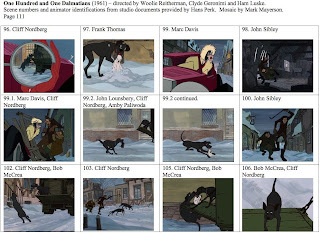 Europa Film Treasures, an online archive of films, has a section devoted to animation. 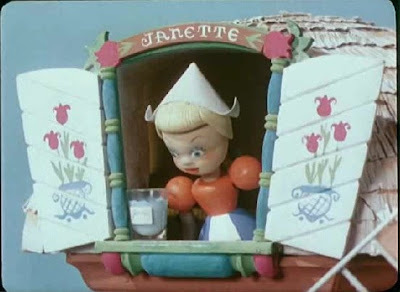 The highlights of that section, by far, are two films produced by George Pal: The Philips Broadcast of 1938 and the Puppetoon Tulips Shall Grow (pictured above). Both are from excellent colour prints and include the original titles. 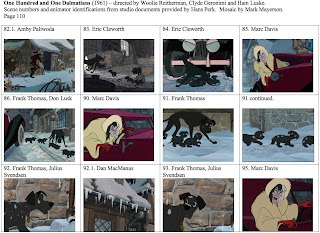 The other animated films there are more historical curiosities than satisfying entertainments. 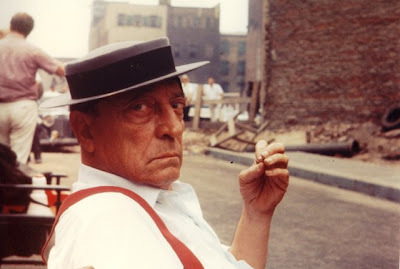 However, for John Ford fans, the site does include a rare Ford feature done at Universal starring Harry Carey, Bucking Broadway from 1917, Ford's first year as a director. Very few of Ford's Universal films survive, and this one is a well-preserved print. Those living in the U.S. can order from xlibris.com. There is no direct link for this volume up yet, though I assume that it will appear in the next day or two. Those outside the U.S. will have to wait until the book is available through Amazon, the online book seller, which usually follows in about six weeks. I've read every volume in this series and have enjoyed them all. Some interviews provide new historical knowledge, some amusing anecdotes and others technical information as to the procedures at the studio. 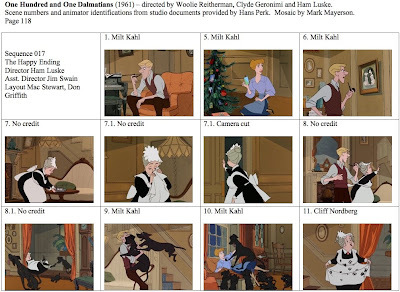 If you have any interest in Disney or animation history or technique, these volumes are worth reading. A commenter named Holger suggested that I list the mosaics in the sidebar so that they'd be easier to find. It's an excellent suggestion and I've started the process. While I generally like Blogger, it does have limitations. The first is that there seems to be a limit as to how many posts will display with a given tag. 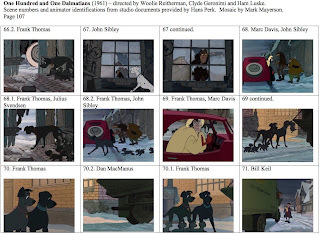 For instance, if you click on the "101 Dalmatians" tag at the bottom of an entry, you will not get all the posts relating to that feature. 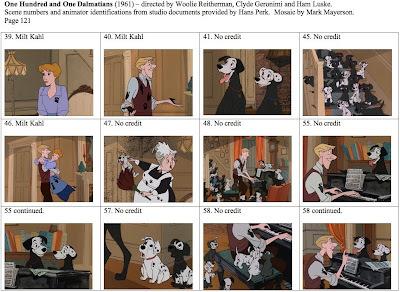 For that reason, there are no sidebar links listed for Pinocchio or 101 Dalmatians yet as I have to figure out how I'm going to handle them. The other thing is that Blogger will display the posts relating to a tag with the newest on top. As a result, the actual mosaic, which is usually the first thing I post relating to a cartoon, will be at the bottom with later commentary above it. In the future, I'll probably put together a "Best of" list on the sidebar, with articles that I think still have value even though they may have been posted some time ago.